We have a new lunchbag. A new Bentogo. And a new thermos. It is time for my Kindergartener to take his lunch to school. Boo Hoo. Making lunches is one thing I dread, but I think it will be easier for P’Diddy. He likes many different types of finger foods and I think if I just change them up each week it won’t get too boring. He will be only be taking lunch twice a week so I can do this, right? Here was my first go and one thing I did do for my five year old was pre-string his cheese and take his YumEarth fruit snacks out of the package so they would be ready to go. I am so thankful for YumEarth! I think my kids finally realize that NO I will not buy ‘regular’ fruit snacks at the grocery store. Why would I when I can buy yummy snacks that are Certified USDA Organic, All Natural, Real Fruit Extracts, No Artifical Colors or Flavors, No High Fructose Corn Syrup that actually take good and full of flavor?! They are perfect for school snacktime too! Small, lightweight, and oh so fun with the fruit shapes. They come in banana, cherry, peach and strawberry or the tropical mix with pineapple, raspberry and mango! Grab some YumEarth Fruit Snacks this school year! I partnered with YumEarth for this post and all opinions are my own. This giveaway will end on September 4, 2015 at midnight EST. Winners will be drawn via rafflecopter. Once a winner is drawn I will contact them and they will have 48 hours to reply before I draw a new winner. Giveaway is open to anyone in US and you must be 18 years of age or older. Giveaway not affiliated with Facebook & I release them of liability. Winner will be posted in the rafflecopter widget. I love to make wraps and then cut them up to look like pinwheels. They are fun and you can fill them with so many different things. I love fresh fruit salad as a snack in a lunch. Peanut butter and banana sandwiches are a standby; tasty and full of nutritious..stuff. My guys like pretzels, Peanut Butter & Co Cinnamon Raisin PB or other delicious flavors for dipping, celery sticks, carrot sticks, grape tomatoes, cheese cubes or cheese slices and even toasted garbanzo beans. My granddaughter eats gluten free so she wants snacks like this for her lunch. On days that I watch her we even make gluten free pancakes for her lunch. She likes them plain with strawberries and yogurt. Organic apples and organic cashews. My daughter isnt too big on sandwiches...she likes to take bagels with cream cheese. The little bagels are great to pack in lunches. Thank you! I do a lot of granola bars, and veggies with peanut butter. I try to do things that have some protein. These snacks sound yummy. I love they are made with good ingredients. Baby carrots, peanut butter and jelly sandwich. I like to make my own oatmeal bars to send with them. I know what is in them and I add a lot of whole oats. Fruit, cheese & crackers are always great. First, I LOVE these fruit snacks! They are so tasty. But to answer your question about lunches, we're kind of boring here. My younger kids do like dipping things in their lunches such as pita triangles and hummus or apples and peanut butter. Kids are all grown up here so I am no longer packing lunches. My grandson would love these snacks when his Mom says OK! Dd is pretty simple! Right now she takes fresh fruit (this week was strawberries and grapes) and a PB & jelly sandwich (half a sandwich) and a Chobani yogurt tube with a water bottle. My favorite school lunch includes a healthy sandwich, fresh fruit, and string cheese. Hummus with fresh in-season veggies and apple slices with almond butter! My son really likes fresh cucumbers and roasted red pepper hummus. their favorite sandwich filling, fresh fruit, cheese and crackers for snack, thermos of juice/milk. My kids always like the carrot sticks with the Ranch Dressing. I like making bite-sized pieces from dinnertime favorites! I love making school lunches. We are partial to peanut butter in all its forms here. I like sending rice cakes because my kids love the crunch of them. We freeze the yogurt sticks so they stay cold, cheese sticks, sliced mangos, anything from annies! i like to keep it simple: pb&j, fruit of child's choice, veggie & drink. wholesome and easy to eat. I love grapes in a lunch, and quesadillas are a nice change from regular sandwiches. My SIL has a quesadilla maker and makes them all the time for her girls. healthy snacks- my kids like dried fruits, granola bars, seaweed snacks, etc. Wraps are a great healthy option! Peanut butter and jelly sandwich with milk and a banana. Love YumEarth! We do a lot of leftovers remade! My kids love grilled chicken salad for lunches. My kids like bringing salads for lunch, or soup in a thermos. i made homemade corn dogs for my daughter the other day! She loved them! Cornbread mix in a cupcake liner with a cut hotdog to fit and baked according to the box! She loved having something different at school! I would love to try the gummy bears and I think the fruit snacks would be great for school lunches. My daughter loves cheese and crackers paired with fruit and veggies! My fave school lunch ideas are sliced veggies with dip (guacamole, hummus) and mix of dried fruit, seed and nuts to add to yogurt, it's a great way to get the kids to eat it together! My Son gets the biggest kick when I use a sharpie and draw a heart, xoxo or I love you on his banana for lunch! I pack a PB & J sandwich, grapes and some apple juice in my daughter's lunch. one ex: dino nuggets, broccoli, grape tomatoes, olives and a string cheese. Homemade Lara bars, homemade paleo nuggets, fresh fruit salad, cheese, crunchy broccoli & carrots, apples and nut butter, chicken yakitori. Fruit cut up in fun shapes kids love them and help create them too. I love making turkey or ham pinwheels for my daughters lunch, usually paired with some veggies! Changing things up not only makes it fun for her, but less monotonous for me! I like carrots with hummus. I remember the kids in school who had the worst lunches, like maybe just a hotdog and no bun. I thought it was weird when I was a kid, but it is sad as an adult. We love Baguette Pizza. I am terrible at baking bread so we buy fresh and whole wheat but I toast it in the morning and put all the fixins in bowls so she can make it at lunch. Way better for her than school pizza. I typically pack leftovers for lunches along with fresh fruit and veggies. Our favorite lunch box food are peanut butter and jelly sandwiches and carrots...it's always a hit! Grapes, Crackers, Cheese, grilled cheese sandwich, apple slices, kiwi, quesadilla, avocado sandwich, my kids are difficult to eat lunch so i try anything, chicken nuggets, fries, hamburger with cheese, chips, mini tacos. A ham sandwich, grapes and chips with a Capri sun are always the best. 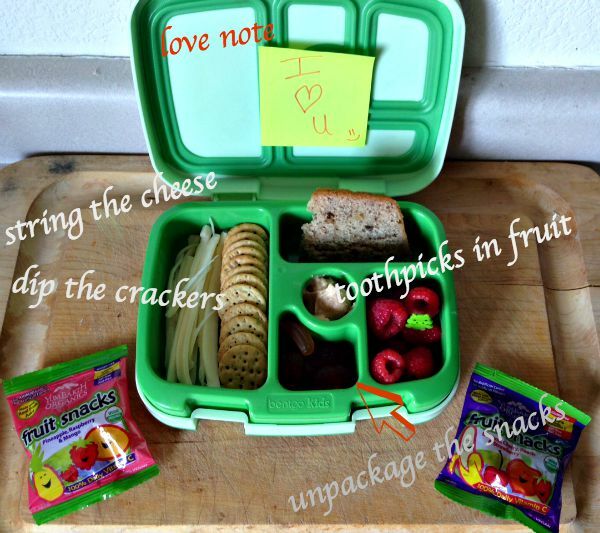 Yogurt, string cheese, P&J sandwich, grapes, blueberries, banana, carrot & celery sticks, apple sauce, apple juice or water are some of my granddaughter's favorite items to choose from for hert lunch box. In my kids lunch I do peanut butter & jelly sandwich, some cookies, chips, some fruit like apple slices, a juice box. I like soup, string cheese, and yogurt. I love Yum Earth lollipops in pomegranate! 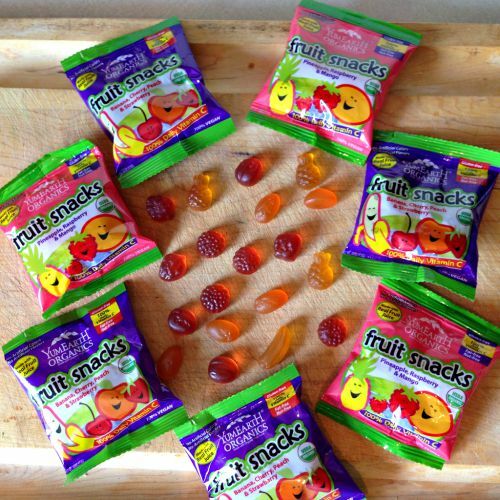 Haven't tried these fruit snacks yet, but based on their other products, they have to be yummy!